According to the International Olive Council, Spain completely smokes the competition when it comes to olive oil production. In 2009, Spain exported 1,150,000 tons of olive oil obviously winning this race in a stunning breakaway. Put that in context and that’s 40% of all olive oil produced in the world. Italy, tries to close the gap, but fails, and comes in at second place at 560,000 tons. Olive oil is produced nearly everywhere in Spain. Although, 80% of the olive oil is produced in the southern third of the country in the region of Andalucia. On Monday, the Vuelta stage will take us firmly into that region, so we need to be prepared. This recipe does nicely featuring a really flavorful infused oil. The longer the oil sits, the better it becomes. And, with the leftovers you can dip crusty bread in it or drizzle it over tomatoes or grill even more vegetables with it. Put the oil and garlic in a small pot and set over medium-low heat. Bring to a simmer and cook for just 5 seconds, then immediately turn off the heat. 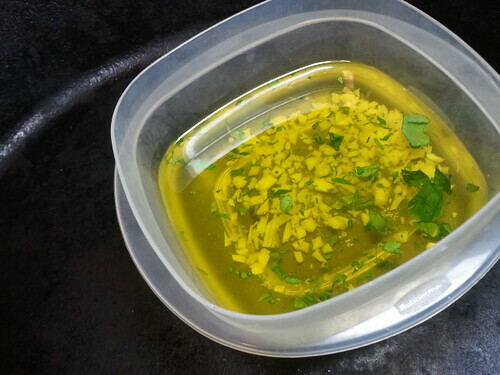 Let the oil cool for 15 minutes, then stir in the salt and parsley. The oil is ready to use, or it may be transferred to a jar and refrigerated for 3 to 4 days. Bring it to room temperature before using. Set a cast-iron griddle or cast-iron frying pan over high heat. Let it et hot. Dribble just enough olive oil, about 1 tablespoon, to grease it lightly. 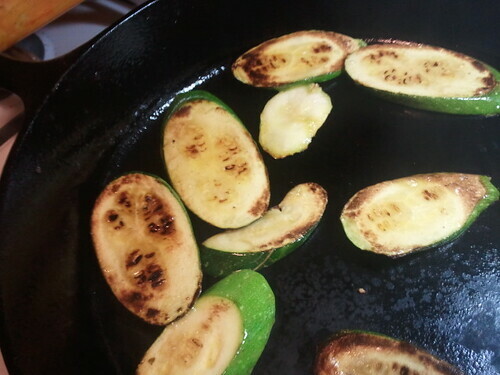 When the oil is very hot, a matter of seconds, lay down enough zucchini slices to cover the bottom in a single layer. Do not overcrowd. Cook for about 2 minutes, or until the bottom of the slices turn a rich medium brown. You may need to move the slices around so they all cook evenly. Turn the slices over. Cook for another 2 minutes, or until the second side turns medium brown. 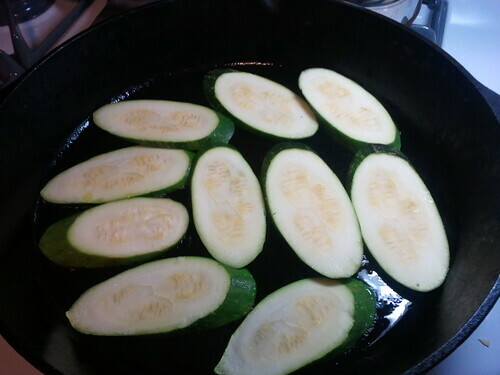 Remove the slices from the pan and arrange in a single layer on a large platter. 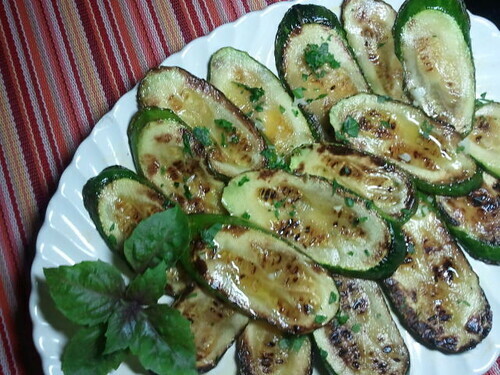 Cook all the zucchini slices this way. With each batch, remember to add enough oil to keep the pan lightly greased. 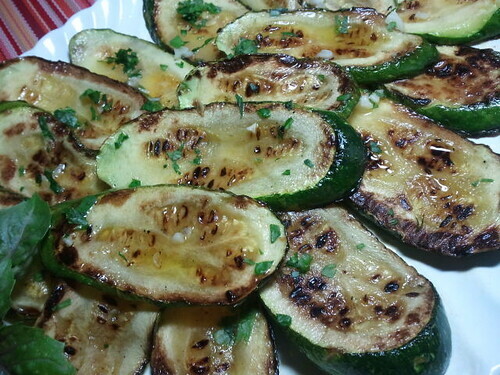 When the zucchini are all cooked, lightly sprinkle salt over the slices. Dribble the flavored oil evenly over the top, sprinkle on the parsley and serve.